Specially designed for use transporting Chicks & Eggs needing to be brooded during this time. Also can be used as a standby unit during mains supply failure. The A.B. 12v DC Portable Brooder has been developed to provide a well insulated cabinet to conserve electrical energy from a vehicle or battery supply, yet allowing the chicks to travel in comfort at a brooding temperature. Being a Moving-air Brooder, the air is circulated by a small fan in the top of the inner brooding area, the air is drawn over the heater, and down the sides of the brooder coming up through the mesh tray, on which the tubs containing the chicks are placed. This gives an even air flow throughout the brooding area. 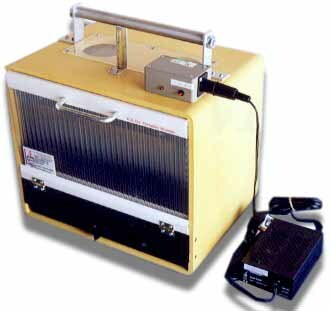 The Brooder operates from 12v DC supply, via a special lead with a cigar lighter plug fitting, or a similar lead which has crocodile clips for use on a battery. The string type heater is closely regulated by the latest solid- state proportional thermostat housed in a control box on top of the cabinet. A full range of temperatures can be obtained via the screwdriver adjustment on the front of the control box. (2O.O°C - 37.O°C). (Note; maintaining high brooding temperatures are subject to an ambient of 1O°C/5O°F or more) The cabinet is constructed of tough PU plastic with high insulation qualities. A strong aluminum carrying handle is fitted across the top of the cabinet, together with two double glazed holes to provide light and to view the chicks. A double glazed transparent drop down door is fitted to provide easy access and light to the occupants, secured with a magnetic catch at the top. The inner case has sides of aluminum, removable mesh floor, and perspex roof with a mesh protected fan. A draw tray is fitted to the bottom to catch seed etc. or a small water dish to provide humidity should it be required. Ventilation holes are provided at the rear of the cabinet. Brooding area = 275mm wide, 240mm deep, 205mm high. A special 7. amps Mains 230/240v AC / 12 volt DC Step-down Transformer available as an optional extra.